The Winnipeg Jets entertain the Anaheim Ducks tonight in the second game of a three-game homestand…The Jets opened the homestand by defeating the Columbus Blue Jackets 4-3 on Thursday…The homestand concludes Tuesday against the San Jose Sharks. The Jets went 8-4-0 in January, which was tied for the second most wins and fourth most points in the NHL…Winnipeg outscored their opposition 41-32 in the 12 games…Kyle Connor (9G, 4A), Mark Scheifele (4G, 9A), and Blake Wheeler (3G, 10A) led the Jets in scoring in January with 13 points each in 12 games…Connor’s nine goals were tied for third in the NHL and one behind the league leaders…Jacob Trouba led the Jets with five power play points (1G, 4A) last month and factored into more than half of Winnipeg’s eight power play goals in January. The Jets erased 2-1 and 3-2 deficits on Thursday to improve to 18-16-1 in games in which they have trailed…Conversely, Winnipeg is 15-0-1 this season in games in which they haven’t trailed in regulation…The 18 wins in games they trailed are evenly split with nine at home and nine on the road…Eight of the 18 wins have come in overtime or a shootout…In a further seven victories, the Jets scored the game-winning goal in the third period, including five times in the game’s last 10 minutes…At 9-8-0, the Jets are one of two teams in the NHL with a winning record when trailing after the first period and Winnipeg’s six wins when trailing after the second period are tied for second in the NHL…Winnipeg’s largest comeback occurred on Dec. 2 on the road against the New York Rangers when the Jets trailed 3-0 in the second period, but won 4-3 in a shootout…The Jets are the only team in the NHL with a perfect record when tied after the second period this season at 10-0-0. Winnipeg has won six consecutive games and 10 of their last 12 contests at Bell MTS Place to improve to 19-6-2 at home this season…The Jets’ six-game home winning streak is their longest of the season…The Jets have the second most wins and are tied for the most points at home in the NHL…The Jets have the best power play at home in the NHL this season at 35%…Winnipeg’s 28 power play goals at home this season is second in the NHL…The Jets are 15-for-39 (38.5%) on the power play in their past 12 home games…The Jets have a 51-13-4 record at Bell MTS Place during the past two seasons, making it the toughest building in the NHL for opposing teams to play…The Jets have scored 103 goals at home this season, which is third in the NHL, and have outscored their opposition 89-46 in their 18 wins…Winnipeg has scored at least four goals in all six games of their home winning streak. The Jets are in a stretch of 11 games (2-1-0) in 20 days…Winnipeg went 6-3-0 in nine games in 16 days leading into the break…The Jets are playing their last 34 games of the regular season in 69 days. 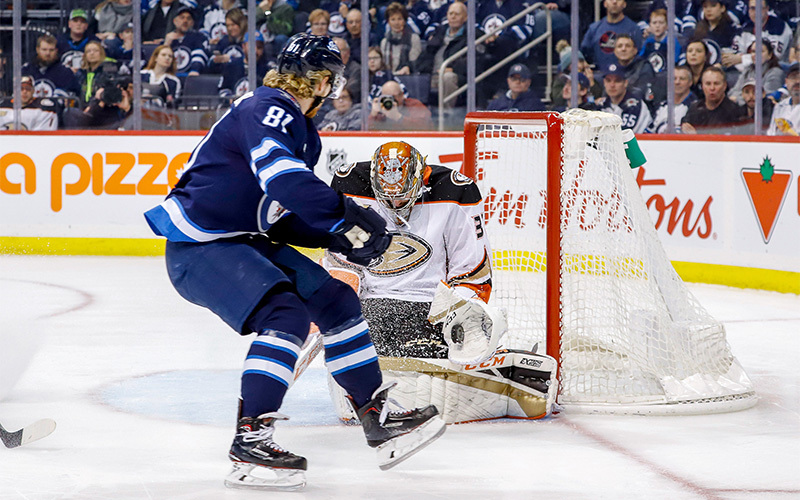 The Jets are 10-3-1 against Pacific Division opponents this season and have won five of the past six games…Winnipeg was a dominant 17-4-2 against Pacific Division foes last season and are on an 20-4-3 run in their last 27 games versus the Pacific…Mark Scheifele (6G, 9A) leads the Jets in scoring against the Pacific Division this season with 15 points in 14 games. Winnipeg has scored four goals or more in nine consecutive victories and in 15 of their past 16 wins… Meanwhile, the Jets have been limited to two goals or less in eight consecutive losses and have been outscored 26-8 in those games…Of the 51 games the Jets have played this season, 31 have been decided by two goals or more. The Jets are second in the NHL with 70 goals in the third period this season…Winnipeg’s plus-21 goal differential in the third period is second in the league…The Jets have scored in the third period in 10 of their past 11 games (19G), including two goals in five of the past six games…Patrik Laine and Kyle Connor lead the Jets with 10 goals in the third period this season. Jets head coach Paul Maurice is two games away from reaching 1,500 NHL games coached…He’s slated to reach the milestone on Tuesday against the San Jose Sharks…Maurice will be the sixth coach in NHL history to reach 1,500 games coached, joining active NHL coaches Barry Trotz (New York Islanders) and Ken Hitchcock (Edmonton Oilers)…Maurice is ninth in NHL history with 681 wins and needs four wins to pass Pat Quinn for eighth place…He is the winningest coach in franchise history with a record of 221-148-45 during the past six seasons…Maurice became the head coach of the Hartford Whalers in November of 1995 and coached his first NHL game on Nov. 7/95 against the San Jose Sharks, which Hartford won 7-3…One of the goaltenders in that game for San Jose is Jets goaltending coach Wade Flaherty. Kyle Connor has scored three goals in his past two games, including the game-winning goal in both games…He has 10 game-winning goals in the past two seasons, which is second on the team to Patrik Laine’s 11 game-winning goals…Connor has scored a team-leading 10 goals in third periods this season and five of those have been scored in the last two minutes of the period…He has nine goals in his past 11 games. Seven of the Jets past 10 goals have been scored by Kyle Connor (4), Jack Roslovic (2), and Mason Appleton (1), who were all drafted by the Jets in 2015…Going back to a 4-1 win against the Nashville Predators on Jan. 17, 12 of Winnipeg’s past 15 goals have been scored by players age 23 or younger…The average age of the scorer of those 15 goals is 23.3. After scoring 19 goals at Bell MTS Place with the Manitoba Moose, Mason Appleton scored his first goal at home as a member of the Jets on Thursday…Along with Brendan Lemieux and Andrew Copp, the trio on Winnipeg’s fourth line have scored in three of the Jets past five games…Since Jan. 17 at Nashville, the line has matched Winnipeg’s top line with five goals at even strength…Appleton, Lemieux, and Copp are a combined plus-23 this season and are outscoring their opposition 5-1 when they are on the ice together…Four of the five goals are from the high danger scoring area. Mark Scheifele opened the scoring against Columbus for his team-leading 26th goal of the season in 51 games…He has surpassed the 23 goals he scored last season in 60 games…Scheifele scored a career-high 32 goals in 79 games during the 2016-17 season…He has been the Jets most consistent point producer of late with at least one point in 11 of his last 13 games (4G, 9A)…Scheifele hasn’t gone back-to-back games without a point since a four-game pointless streak from Dec. 27-Jan. 4. Blake Wheeler is second in the NHL with 54 assists this season and has 10 assists in his past 11 games…His 1.06 assists per game this season is a career high…He needs 16 assists to match the career high of 68 assists he had last season…Wheeler’s 37 primary assists are also second in the NHL this season…During the past four seasons, Wheeler leads the NHL with 222 assists and 155 primary assists in 296 games. The previous three games between the Jets and Ducks have been decided in overtime or a shootout. The Jets have earned a point in each of their past five games against the Ducks (4-0-1), including three consecutive wins at Bell MTS Place. Winnipeg is 4-for-17 (23.5%) on the power play in their past six games against the Ducks. The Jets are 1-for-17 (5.9%) on the power play in their past five home games against Anaheim. The Jets are 13-for-15 (86.7%) on the penalty kill in their past six games against Anaheim. Since the Jets franchise relocated to Winnipeg in 2011, 10 of the 17 games between the Jets and Ducks have gone to overtime or a shootout. The Jets are 5-5 in those 10 games. In 30 total games between the franchises, there has been only one shutout (5-0 L on Nov. 4, 2001). Dustin Byfuglien (3G, 14A) and Blake Wheeler (7G, 10A) lead the Jets in career scoring against Anaheim with 17 points each. Goaltender Connor Hellebuyck is 3-0-1 in four career starts against the Ducks with a 2.13 goals-against average and .924 save percentage. Jets’ forward Mathieu Perreault played the 2013-14 season with the Anaheim Ducks collecting 43 points in 69 games. Ducks’ centre Ryan Kesler played 111 games in Winnipeg for the Manitoba Moose from 2003-2005. Ducks head coach Randy Carlyle played 564 games during 10 seasons with the original Winnipeg Jets from 1984-1993. He also was an assistant coach for the Jets during the 1995-96 season and head coach of the Manitoba Moose from 1997-2001 and 2004-05. Anaheim’s Cam Fowler and Ryan Kesler were teammates with Winnipeg’s Blake Wheeler on the 2014 U.S. Olympic team that competed in Sochi, RUS. Jets defenceman Josh Morrissey and Ducks forward Nick Ritchie won a gold medal with Canada at the 2013 U18 World Championship. Needs one more game played to reach 600 as a member of the Jets franchise. Needs two penalty minutes to reach 100 for his career. Needs one game played to reach 600 for his career. Needs eight games played to reach 100 as a member of the Jets. Needs five assists to reach 300 for his NHL career. Needs two points to reach 100 as a member of the Jets. Needs two points to reach 300 for his NHL career. Needs one multi-goal game to pass Marian Hossa and take sole possession of third in multi-goal games in franchise history. They are both currently at 21.